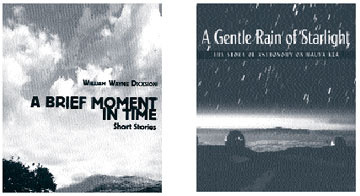 "A Brief Moment in Time"
This is one of four paperback novels written by Dickson that are aimed at young adults. The other three novels are "Beyond the Valley of Mist," "Puma Son of Mountain Lion" and "Sagebrush." "A Gentle Rain of Starlight"
By Michael J. West, Ph.D.
"A Gentle Rain of Starlight" is the story of astronomy atop Mauna Kea on the Big Island. The book contains many color photographs of the largest and most sophisticated telescopes in the world.